The following was distributed (not by me) at an event called “The Moving Left Show” in the early 80s and imitated the format of a leaflet advertising the event. It’s not an analysis but a slap in the face. Welcome to the most predictable event in years, organised by the pseudo-oppositional Left community. See Benn and Napolitano speak with forked tongue! Every so often you need to brighten up your sophisticated slavery in a crummy career with new ideas, and find sublimations for your desires which ensure a good future forthis society! Be merely thought-provoked by a whole bunch of lecturers, journalists, social workers, TV directors, actors, professsional charity workers, politicians, even priests, and other errand-boys of power. And that’s all! – But in case you want the illusion of something more you can sleep through alternative cabaret, video, films, and a rock concert, not to mention other means of kidnapping our lives. Grey saint Tony Benn will be spouting off about some means of perpetuating the buying and selling of forced work, the stabilisation of the commodity economy, saving international capital nationally, being explicitly reformist and anti-revolutionary, and giving the working class the chance to participate in their alienation through praliamentary cretinism. For which great project they will need a new police, now with added « potential for change ». In which regard, Napolitano will explain how his Italian Copmmunist Party directed police, armed with tanks, to crush the proletariat in Bologna in March 1977. So – join the Communist Party – in chucking lies and bullets at the real social movement everywhere! We wish you a pleasant evening afterwards. We suggest some drinks to give you that feeling of individuality within safe roles. And to suppress anxiety may we recommend some old ideology routines and the ritual conflicts of arguing isms against isms. This way you can rest assured that nothing will change – least of all yourself. On the way home the proletariat will be waiting for you with irony and disgust. After the recent 7/7 bombing Ken Livingstone proved a cleverer politician than Tony Blair, who just came out with obvious hyopocritical soundbites. Our Ken cried genuine tears as he denounced the attack on “working class” people, whether Christian, Jew, Muslim, agnostic or whatever. These tears came from his ‘ordinary’ roots which makes him less of an actor than the more bourgeois Blair. Lets look a little at some of his populist past. Ken Livingstone achieved his lefty reputation as head of the GLC in the early 80s, becoming the bête noir of Thatcherites everywhere, with his cheap fares policy etc. But, like all politicians, he was – and is – an opportunist creep. In 1999 he retrospectively supported the Gulf War just as he was supporting the massacre of Serbs and Kosovans by Nato bombing. Though he’d ‘opposed’ the Gulf War at the time, he said he’d been wrong to oppose it: lest we forget, the Gulf War killed at least 4000 times as many mainly working class people than the horrific 7/7 terorist attacks in London. In the year 2000 he loudly condemned the May Day rioters who wrecked MacDonalds and defaced a statue of Winston Churchill, saying that Churchill, whose death in 1965 was celebrated by Welsh miners, was Britain’s greatest Prime Minister (for more on this see “You Make Plans – We Make History”). This leaflet shows what the GLC was really about. It was produced by me and the Campaign for Real Life and distributed at the Ken Livingstone-run GLC festival in 1984, whose theme was “Work for a change”. 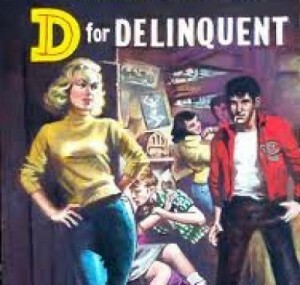 In the swinging 60s everyone could have a job, and everyone hated their job. In the 70s the workers hardly worked and the rulers could hardly rule. That’s why in the 80s jobs are rationed – to make us appreciate them more. As well as a way of getting rid of uncompetitive technology, the povery and isolation of the dole has been the ruler’s means of dividing, demoralising and intimidating the masses, who had begun to dangerously discover their power against the misery of work, of exploitation. The ‘English Disease’ (suffered by capital, enjoyed by workers – the world over) – i.e. resistance to work (absenteeism, sabotage, and all forms of direct solidarity) is conveniently ignored by the ideologists of the Left. That’s because the Left represents those wage laboureres who still identify with their allotted role in the running of the World Market, who still see the means of survival imposed on them as ‘dignified’. Fearful of the refusal of ‘The Dignity of Labour’, and even more terrified that incresing sections of the jobless are resisting all political representation (which many visibly did in the riots of ’81), they can only patronise their would-be voters with the carrot of future forced labour for all (London Labour Briefing has even called for the defence of the notorious Youth Training Schemes against the government’s cuts). The Good Guys of the Left wsh to inherit the world market and further rationalise alienation minus (some of) its Evil anomalies. For those who wish to be saved by the Good Guys, the enemy’s apparent enemy seems like a friend. Those resigned to false alternatives always have to choose sides to avoid making sides. All those who try to adapt to and reform the alien economy, like the Saatchi and Saatchi ads, just want to be accepted because of their promises of a better future, because of their ‘good intentions’ – a convenient mask over the brutal anomalies they perpetuate in their present practice. If the jobs the Left are creating in the present are anything to go by, our future in their hands will be as bleak as anything the Right could concoct. Like the big increase in the employment of fares inspectors on the tube. Or the massive boom in vacancies for riot cops in Effra Parade in Brixton. Or the mounting prospects for those seeking a job smashing and bricking up squats in various Labour-controlled boroughs. Or the rising possibilities for those whose ambition has always been to become a concerned socialist bailiff, evicting council tenants who don’t pay their rent, whilst crying tears of compassion for their plight. “But what about all the good the GLC is doing?”, whines the liberal. “Like positive discrimination for minority groups?” “Positive Discrimination” – say, in housing – in the present conditions of artificially enforced scarcity, can only become a way of discriminating against one section of the proletariat and helping another section. It merely inverts the divide and rule operated by the more traditional forms of class power. Why should heterosexual proletarians remain in the housing queue, whilst gays can jump the queue? The GLC obviously doesn’t advocate the direct seizure and transformation of territory, of offices, of banks, of university buildings, of hotels, of palaces, etc. as a method of dealing with the false scarcity of housing – because they know that County Hall might be amongst the first to be taken over. Instead they perpetuate the divisions – and give material reasons for ‘straight’ proletarians to resent gay proletarians, just as gays have good reasons to resent ‘straights’ in this society. This ‘balancing out’, under capitalism, shows just what the ideology of equality means: equality of resentment, equality of humiliation, equality of separation. This resentment, intensified by the Left’s moral blaming attitude, is repeated in the insulting ads for the GLC’s anti-racism year: “1 million Londoners are getting a raw deal because the other 6 million let it happen.” This liberal garbage takes the blame for racism away from the Nation, its frontiers and its institutions – and puts it simplisticly onto everyone, regardless of their material position and their choices. In the riots of ’81 (which Ken Livingstone described as “disastrous for the community locally”) black and white, gay and ‘straight’ proletarians discovered true community by attacking directly the “raw deal” they get from this world. Since then, what the Tory’s social security race checks and Nationality Acts can’t do to prevent such real equality from recurring, the Left’s patronising ‘positive discrimination’ will make up for. Or take the Great Fares Fluctuation Saga – when the GLC tried to encourage the efficient and rapid moblity of wage-slaves and consumer-slaves through the lonely crowds of London’s Public Transport. Even within its own narrow terms, one would have thought that Leftists would’ve at least threatened mass law-breaking in response to this flagrant insult to ‘democracy’ – even in its bourgeois forms, an insult which led to 80 extra deaths and innumerable extra fumes and ulcers on the roads these last 2 years. But no! – on the day London’s fares became the most expensive in the world, Ken Livingdeath dutifully paid his full fare before the TV cameras and said that the way to change this flouting of bourgeois democracy was through…bourgeois democracy! Frightened that the breaking of the Tory law might encourage the rejection of their own management of the law, they even introduced a big increase in fares inspectors to deal with both those who refused the law-lords’ fare prices, and those who refused to pay altogether. 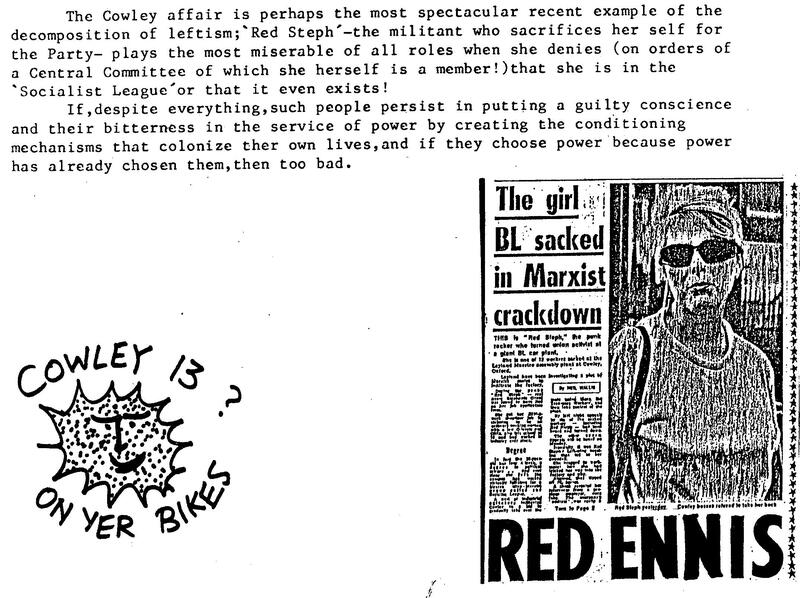 Dave Wetzel, the GLC Transport bureaucrat who in April ’82 had been prepared to go to prison, 6 months later decided that proletarians should be prepared to go to prison for him. And yet Leftists still claim that the GLC is at least a buffer against the harsh force of raw capitalism. With buffers like this we can only expect an endless increase in repeats of the Moorgate disaster! Far from acting as a buffer, Left-wing capital is merely the soft face of Right-wing capital. That’s why the Left’s calls for ‘Community Policing’ have been taken up as Neighbourhood Watch schemes by the Right: either way, it means each person policing the rest in obedience to the laws of the commodity. Since community doesn’t exist outside of struggle against this world, Community Policing can only mean policing the ‘community’ bound together by a ‘respectable’ submission to property laws. That’s why K.L.’s buddy, Ted Knight, sends the riot cops against squatters. And that’s also why Ken Livingstone evicted squatters as Chairman of Camden’s Housing Committee. “The riots will all happen again. I think you will only get real change in Britain when you link the extra-Parliamentary qctivities of all the groups and their manifestations with a constructive response within Parliament. If you actually think back to what happened in Paris in ’68, all that happened completely by-passed the French Assembly and therefore it all peaked out quickly.” – Ken Livingstone, The Face, May 1984. Doubtless K.L. identifies with those involved in May ’68 who did push the wildcat General Strike and Occupations Movement into a parliamentary direction – the French Stalinists in the Communist Party. With the Right, the CP managed to sieze the initiative and to lie, manipulate and herd the movement back into the estranged isolation of the TV and the ballot box (two capitalist cons that Ken Livindeath is fond of using): these specialists were obviously helped in this by the fact that in May ’68 the vast majority of proletarians had still only developed pretty limited initiatives, perspectives and mistakes of thier own, and that, despite having launched a movement in which the Left, as usual, were left behind, they largely failed to assert any decisive opposition to the Left. This is a mistake the rioters of ’81 started to go beyond. For instance, when the Militant Tendency’s Claire Coyle spoke of the riots as “understandable but inexcusable” she was howled down. She was further silenced by the repeated chorus, “Bigger cages, longer chains!”. Nevertheless, many of those who have given the Leftists the boot have got the boot of the State back in their faces – as in Effra Parade in Brixton during March this year, when Ted Knight called out the riot cops, equipped with water cannon, to evict squatters. Or in Bologna in Italy, KL’s favourite municipality, which he regards as a centre of “dynamism” (The Face, May ’84), where in 1977 the Italian CP dynamically called out the tanks and the cops to crush the massive autnomous movement against work, sacrifice, authority and mediation. Those who, “on behalf of others”, seek to use the institutions capital presents as being the basis of power will inevitably use such forms to crush those who seek to destroy this power. “If they gave up some of their pen-pushing and bureaucracy, they could get officers back on the streets dealing with crime – including the sale of drugs.” – KL, reported in the News of the World, July ’81, during the riots. “Black kids support what I said about the police, and when I walk down the Kilburn High Road, people shake my hand.” – K.L. in ‘Not…’, August ’81. “I feel a degree of regret that Marshall did not push on and abolish the GLC because I think it would have been a major saving and would have released massive resources which could have been put to far more productive use.” – KL, 11/3/79. “If you are a member of the public trying to get something done, trying to defend one of your rights, this [the GLC] can be a very powerful body to fight against, but in terms of using it positively, it is a very difficult and reluctant machine to use.” Kl, The Face, May 1984. “The fact that you have skills at…manipulation in politics…does not alter your class.”– K.L., The Face, May ’84. Livingstone’s nice guy mediocrity, with its self-consciously reasonable tones and gestures, is a superficial style of ‘honesty’ , hiding the inevitable hypocrisy of his bureaucratic position, a postion that makes irrelevant all his guilty proclamations of working class credibilty. Nevertheless, he serves as a model, for those proletarians who don’t want to face and confront their misery, of polite dialogue with the rulers and the Old World, at a time when large numbers of proletarians are refusing such respectful ‘criticism’ by angrily taking the streets. K.L. – and all those who identify with his ‘ordinariness’ – can only speak the contradictory language of the rulers, the language of manipulation and of commodity calculations, the langauge of 2-faced bullshitters, who say and do one thing one moment and say and do the opposite the next. Those for whom life in the present is “really grim” can only get their confidence back by attacking all those who immensely enjoy their pesent niche within this society, whether their name is Thatcher, MacGregor, Prince Charles or Ken Livingstone. Thatcher has stated that she had her worst 10 nights of sleep during the riots of July 1981: she won’t be the only one with insomnia when proletarians start to wreck the Left-wing of capital – and all its would-be Prime Mini-stars, and not just its Right-wing. The text was followed by a poorly-produced photo of Ken Livingstone shaking the hand of the Queen at the opening ceremony of the Thame Barrier, where he got the Queen to agree to see his mum. A speech bubble is coming out of the Queen’s mouth – “Thank you for helping to protect the Palace from the Thames flooding, and keeping an eye on the IRA, but how are you getting on with the proles?” KL replies, ” I’m doing the best I can, ma’am, but I’m afraid they’re pretty uncontrollable.”. Below that there’s a cutting from The Face in which KL says, “Well, although I’m an agnostic my sort of politics is very similar to other people’s idea of religion. I am not one of those people, though , that believes in scientific Marxism. I’m a left-winger not because it can be proved correct. I just think there are different ways of running society , and think that socialism is a fairer and better way. Of course, it requires an act of faith. There are too many bits and pieces of thought in me to find a convenient label, but I suppose, I’m an anarcho-syndicalist.” This was followed by a newspaper cutting from the Evening Standard, April 12 1984: I’m willing to break the law – Livingstone Mr Livingstone, speaking on LBC, said the Government’s actions reminded him of the slogan often seen scrawled about London – “if voting changed anything they would abolish it.” “The Government has done exactly that,” he said. This leaflet was handed out at a very crowded festival on the South Bank in and around County Hall. It was accompanied by a tape-recorded parody of a record of Ken Livingstone given out free with every copy of Time Out during the week before the GLC event. On the day we went along to a trade union stall which was giving out free ultra-nationalist literature – with a Union Jack on its cover, found the stall abandoned and took all the crap literature out and dumped it into the Thames. When David Blunkett boasted, characteristically, that he would make his predecessor as home secretary, Jack Straw, “look like a woolly liberal”, I doubt there were too many people who believed this was possible. Even Blunkett may not have been able to make ‘Mad Jack’, as he was known in the prison system, look like a liberal, but he is certainly the most right-wing home secretary this country has had in living memory, and he revelled in the fact. Straw may have been at least as Draconian as Michael Howard before him, but he didn’t have 9-11, an event, which if one were needed, gave Blunkett’s innate authoritarianism and xenophobia full-reign. In the wake of Blunkett’s overdue resignation a picture is being painted, with himself as the primary artist, of ‘an honourable man brought low by love’. The career of this vain, arrogant, conceited individual was not brought to an end because of Blunkett’s private life, something he has done his utmost to deny the rest of us, but because he is a liar and corrupt, neither of which are new. I first met David Blunkett in 1974, and later suffered under him when he was leader of Sheffield City Council, and neither his dishonesty, nor his corruption, nor his right-wing views are recently acquired. He’s simply been better in the past at hiding them. First and foremost though, David Blunkett has been a ruthless careerist – no wonder, like Margaret Thatcher before him, he’s blubbing now. Thatcher was a great political ally to Blunkett in his Sheffield Council days, he could cover up the corruption and incompetence of his administration by blaming everything on central government: Northern Grit squaring up to Whitehall. Thatcher was of course despised in Sheffield, leaving the local Labour administration as secure as a one-party state, and they ran it accordingly. As Blunkett well knew, during this period, you could have put a red ribbon on a dog, and people would have voted for it. In the 1980’s Sheffield City Council may have had a publicity machine worthy of Stalin’s Russia, but any talk of ‘socialism’ was never more than empty rhetoric for Blunkett and his pals. Look beyond the publicity and their track record shows that. Under Blunkett, more than half of the council’s own 32,000 employees earned basic pay below TUC guidelines, and 10,000 of them were paid less than the Council of Europe ‘decency threshold’. Women workers got a particularly bad deal, earning far less than their male colleagues, and getting fewer promotions. There was also evidence of racial discrimination, with only 1% of council employees being black, a quarter of what it should have been, and rumours of a ‘colour bar’ in the Town Hall’s heavily subsidised restaurant, where no black person had ever been employed. While lowly council workers got a raw deal there were plenty of jobs and high salaries for the Labour Party faithful. Irrespective of their true politics, careerists from all over the country flocked to Sheffield and joined up. Sheffield didn’t need freemasonry, we had the Labour Party. Usually the jobs doled out to the boys and girls were in social or youth work, Sheffield had more social-workers per head of population than any other place on the planet. In special cases though, a job would be invented, such as the creation of a highly-paid ‘Peace Officer’ role for one Blunkett crony. Blunkett presided over a huge homeless problem in Sheffield, while massive numbers of council-owned properties lay empty for years, and sometimes for decades. Early in 1983 ‘Peace City’ was somewhat embarrassed to find that a group of young peaceniks had squatted one long-empty council-owned building and turned it into a ‘peace centre’. In response, Blunkett’s pal Roger Barton, then Chairman of the ‘Nuclear Free Zones Committee’, personally went round and cut off the electricity to the building. Blunkett however, faithfully promised the young pacifists that they would not be evicted, a promise he quickly broke. Another embarrassment for the Blunkettgrad ‘Nuclear Free Zone’ was when a British Rail guard blew the whistle on the transportation of nuclear waste through the area, a fact the council had tried hard to keep quiet. As homeless figures in the city continued to soar, other long-unused council-owned properties were occupied. The council’s response was always swift and ruthless. Facing immediate eviction one group of squatters wrote to Blunkett personally to ask for a stay of eviction while they found somewhere else to live. With typical arrogance Blunkett replied, “It would seem to me that anarchy can hardly expect reasoned and structured responses within the system which is being attacked.” After the eviction the building stayed empty for several more years. Blunkett’s administration also waged a long and bitter war against travellers, even evicting them in the middle of a TB epidemic. The treatment of Sheffield travellers led to a perinatal mortality rate of nearly 50%. Blunkett and his cohorts constantly railed in public about the corruption of Tory politicians in Whitehall, while Sheffield City Council junkets were legendary and almost every night the Town Hall hosted a lavish function or banquet for some group of councillors or another. Some friends of mine once went to visit Blunkett in his Town Hall office in 1983. Walking in unexpected they witnessed a huge feast laid out, this was Blunkett’s elevenses. A big part of maintaining the illusion necessary to running Blunkettgrad was the notion of ‘squaring up to Thatcher’, so from time to time various ‘stands’ were made, with Blunkett & co promising to ‘stand firm’ against the Tories on various issues. Things were made easier by the fact that to a very large extent the Council ‘owned’ the unions, the tenants associations, the peace groups, and just about every political front, tendency, and organisation operating in the city. One Blunkett ‘stand’ was over ‘rate-capping’, when Sheffield and several other Labour council’s refused to set ‘a Tory rate’. How Blunkett and his pals puffed and panted about this one, before crumbling at the very first opportunity. The discovery of the ‘Tory’ rate demands already typed-up and hidden in Blunkett’s office said a lot about his personal integrity. The inside word at the time was that Blunkett had been instructed to back down personally by Labour leader Neil Kinnock, who was then waging a war against Militant Tendency, particularly in Liverpool where they controlled the anti-rate capping council. Blunkett’s promised reward was the advancement of his cherished political career. He was elected as MP for Brightside, one of the most solid Labour seats in the country, at the next General Election. Another ‘stand’ was against bus-fare increases. The city’s famously low fares had actually begun to increase a few years earlier, but in 1986 Thatcher’s deregulation of public transport threatened to send them spiralling. After more hot-air Blunkett again capitulated, and as always he aimed to crush any uncontrolled dissent ruthlessly. As a member of a group opposed to the fare increases I was sent to prison for putting up a poster advising passengers not to pay. I wasn’t prosecuted by the police, I hadn’t committed a criminal offence, but by the Labour council, for not having planning permission. As home secretary Blunkett’s abuses of human rights and civil liberties have been staggering. He has introduced internment without trial for suspected foreign terrorists, is introducing military camps for children, and barely a day goes by without him dreaming up another crackpot neo-fascist scheme to attack civil liberties, criminalize working-class communities, and put more and more people behind bars. Under Blunkett the British prison population has risen to more than 75,000. Held in appalling conditions, which Blunkett has consistently ignored, growing numbers of these prisoners are driven to suicide, slashing open their veins with slivers of glass or razor-blade, hanging themselves from heating pipes only inches above the floor, or choking on their own vomit through swallowing pills. Callously, Blunkett has refused to meet the mothers of some of the young women driven to these acts of desperation, while his only comment on prison suicides has been to quip that he was inclined to open a bottle of champagne after Harold Shipman killed himself. David Blunkett sought to hide his corruption by playing the ‘my private life is my own’ card he is trying to deny the rest of us. The man who has consistently assured us, in relation to ID cards, that if ‘we have nothing to hide, we have nothing to worry about’ has come unstuck, and those familiar with his ‘computer-like’ mind are probably taking his recent bad memory with a pinch of salt. Blunkett’s assistance with passport and visa applications on behalf of his rich former mistress sits hypocritically with the hard-line stance he has taken with those fleeing war and torture abroad. This is the man who told Kosovan and Afghani refugees to “get back home”. And without wanting to twist the knife too much, his current fixation with acquiring a family, even if it’s somebody else’s, sits uneasily with his past history. The day after his election as an MP, Blunkett announced he was leaving his wife and children in Sheffield and moving in with his ‘research assistant’ in London. His marriage may, as he has recently said, been “a loveless relationship”, but he had found it politically expedient to hide that fact for a long time, and he’s now finding out that middle-class women don’t disappear into the background quite so quickly or so conveniently. Just like Thatcher before him, the only person David Blunkett is able to shed tears for is himself, snivelling that he doesn’t feel sorry for himself and that he’ll “try to have something of a Christmas”, he sounds like Albert Steptoe. Whatever happens to Blunkett, and unfortunately we may not have seen the last of him2, he’s sure to have a better festive season than the families of the record 93 British prisoners who have killed themselves so far this year, those locked up without trial in prisons or detention centres, or the vast number of other victims of his reign as home secretary. Shed no tears for Blunkett, he can shed them himself. In fact, during the 80s in the Sheffield area, one miner told us that the only reason people voted for Blunkett was because they had sympathy for his guide-dog. The scumbag, predictably, is back in office – in charge of stealing the pensions of the working class. One of the better actions of the late 90s involved just a handful (no more than ten) pensioners blocking off the Humber Bridge (I think) for several hours in protest at the attacks on their pensions. Let’s hope such actions multiply against the vicious Minister For Ripping Off Pensioners. 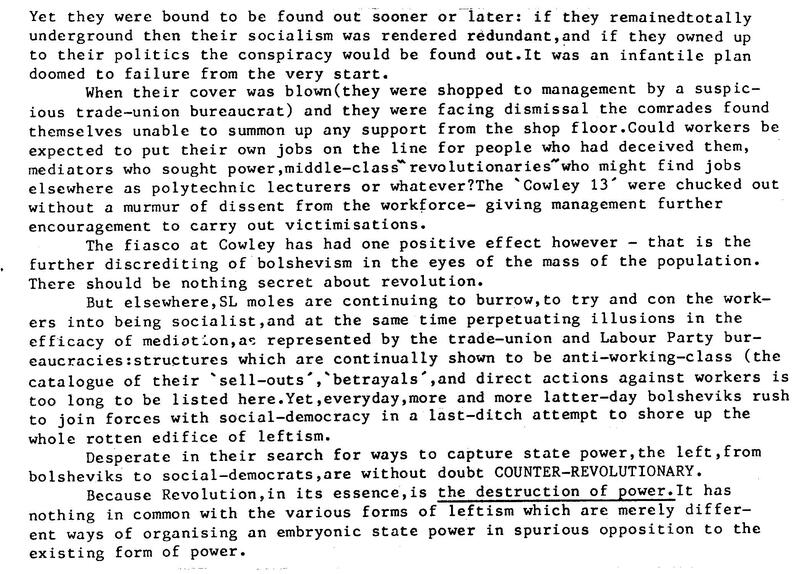 The following, written by Richard Parry (who wrote a book on The Bonnot Gang) was a short leaflet produced in 1982, critiquing a Trotskyist group (International Marxist Group/ Socialist League) who collectively “went to the factories” (in this case Cowley) to secretly agitate for their group’s politics whilst pretending to be “ordinary workers” and not revealing their political group identity.